Wilkins looks like a war zone today. There is nothing there except burned ruins in the sagebrush. It is a far cry from the vital days of the Thousand Springs Trading Post and its café, motel, garage, bar, post office, store, living quarters and truck stop. John Moschetti was proud of the place. He was the boss. Can a wide spot on US93, 25 miles north of Wells, Nevada, with only a few people living there be called a town? You bet it can. 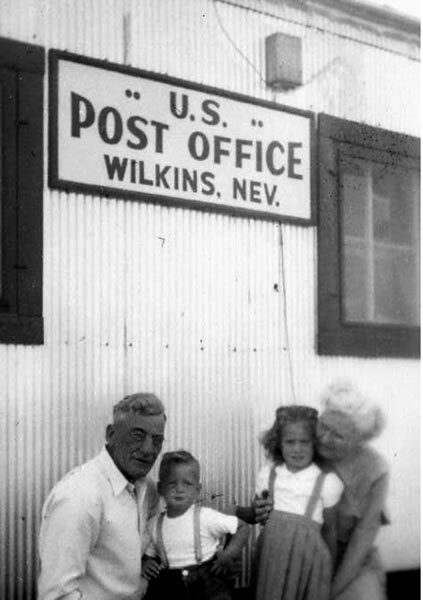 There was an official US Post Office there for almost seventeen years. The place was named Wilkins for Russ Wilkins who, with partner Martin Wunderlich, once owned the Utah Construction Company ranches in California, Idaho, Nevada and Utah, one of the largest livestock businesses in the nation. Moschetti was Postmaster for the entire life of post office – July, 1948 to April, 1963. (John’s wife) Moschetti’s parents. c. 1952. John moved from Colorado to northeast Nevada as secretary to Wilkins when the mighty UC was subdivided into smaller outfits and sold. Around 1947, a trading post was built on the highway near the Wine Cup Ranch where Wilkins headquartered. By then all the other ranches had been sold and Wilkins said John could go back to the Denver office or manage the new Thousand Springs Trading Post. Moschetti opted to take over the roadside business on January 1, 1948, and stayed for 16 years. Russ Wilkins died in 1952 at a young age. His family sold the ranch. 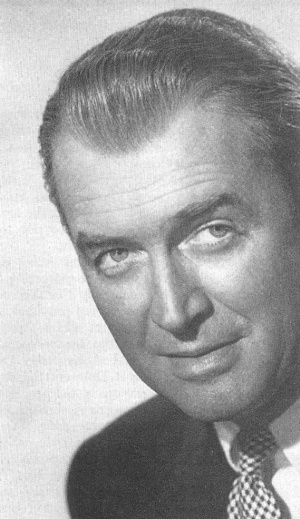 In 1953 the Wine Cup and trading post were sold to a group headed by movie star Jimmy Stewart. They owned the places about four years. A café, bar, motel and garage were added. It was a successful operation. The owners and Moschetti made money. Local businesses and residents bought fuel and supplies. Highway traffic brought in a lot of business. 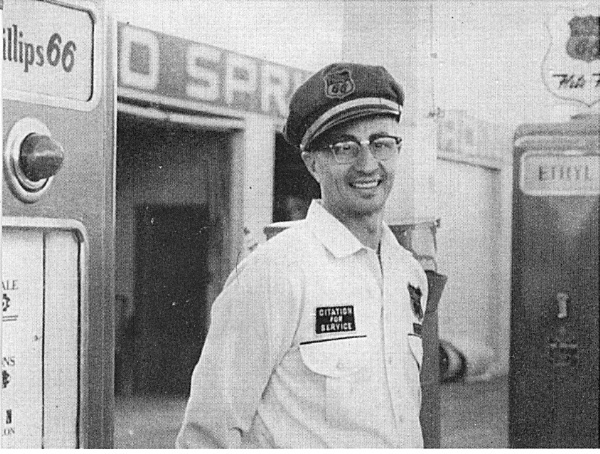 There was a full time mechanic on duty while about twelve other employees kept things running. 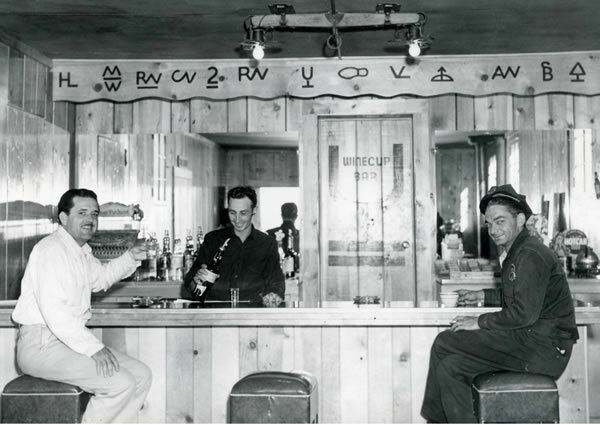 John Moschetti, center, bartending in the Wilkins bar. B.H. Grube was the next owner. He thought there was oil on the Wine Cup and, for years, ranching operations went down hill but the trading post continued to prosper and grow. Moschetti recalls good times and somber events. In early 1949, there was a terrible snowstorm. It snowed and snowed. Hard winds blew the white stuff into drifts that eventually closed the highway. The highway department just couldn’t keep up with it and finally the roads were closed. There were 20 to 30 travelers snowed in a Wilkins. At the time there was no café or motel. People slept on the floor or in their cars while the trading post workers fed them a couple of hot meals every day. They were trapped at Wilkins for four days before the highway department was able to open the highway. The stranded travelers followed the plows to Wells. It had taken 20 hours to plow the 25 miles from Wilkins to Wells. The highway immediately drifted shut again and was blocked for 17 days. The storm made national news. Wilkins in its heyday. Plot plan drawn by Wil Moschetti. One day a trucker dropped off a fellow who was skinned up and bleeding. He complained that he was hungry. John told him he would feed him but he had to clean up himself in the restroom. The man grabbed a large ashtray off the counter and threatened John. John and his brother, Nick, were able to tie him up with a rope. A lot of people were coming and going and there wasn’t much help. There was a hitching post out front. John and Nick took their prisoner and tied him to the post where he remained for the couple of hours it took Sheriff Jess Harris to get out to Wilkins from Elko. The man had escaped from a mental hospital in Tennessee and made it all the way to Nevada before capture. John rushed them to the nearest motel room where they put Lonnie’s wife on the bed. Almost immediately, the baby was born. The new father had been in the Army and knew what to do. He cut and tied the umbilical cord of his newly born daughter and they continued to Elko where medical help was available if needed. Being stuck out in the middle of nowhere, the youngsters at Wilkins were very short of entertainment. Being kids, they found or invented things to do. According to plan, the children were supposed to board the school bus at Wilkins for the 25-mile trip to school in Wells. It didn’t always happen that way. Frequently, they got on the bus in Wilkins and rode north as far as they could go, eventually all the way to Jackpot, where the bus turned back south for the trip to Wells. Those kids put in a lot of miles. When Jackpot finally had students, a typical bus trip was get on at Wilkins, ride about forty miles north to Jackpot, drive back those same forty miles to Wilkins and then the 25 miles to Wells. So, sharpen your pencil and do a little figuring – All that riding in a daily roundtrip added up to more than two hundred miles, but it was fun. Grube sold the Wine Cup to Bill Addington in 1963. Moschetti had operated the profitable trading post from 1948 to 1963. 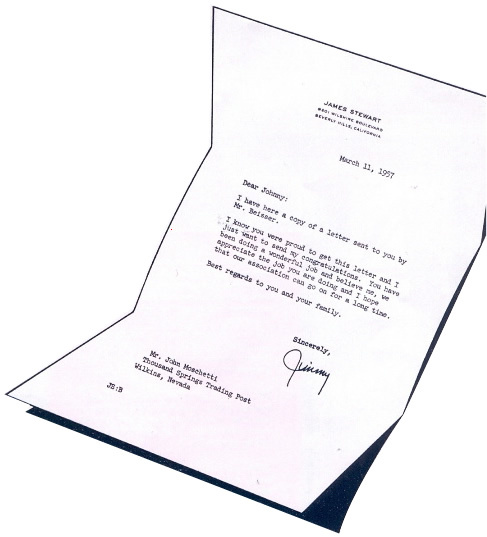 Addington wanted John to work for wages instead of the years-long partnership. John packed up his family and moved to Wells, then Elko. Although Wilkins precariously hung on for a few more years, it was, essentially, the end. Wilkins is one of those places where, if you blink driving by, you’ll miss the place. Still, though, it is one of those sites in northeast Nevada that is now a reminder of history and the years are slowly sapping even memories when someone mentions Wilkins. “Wilkins? Never heard of the place.” That’s sad. Sources: Oral history tape, October 12, 1993, John W. Moschetti, Northeastern Nevada Museum Archives, Elko; Dale Porter, Elko; members of John Moschetti’s family, Elko; Nevada’s Northeast Frontier, Edna Patterson, Louise Ulph, and Victor Goodwin, reprint, University of Nevada Press, Reno, published by the Northeastern Nevada Museum, Elko; and Nevada Place Names, Helen S. Carlson, University of Nevada Press, Reno, 1974. Photographs: From the John Moschetti Family Collection.